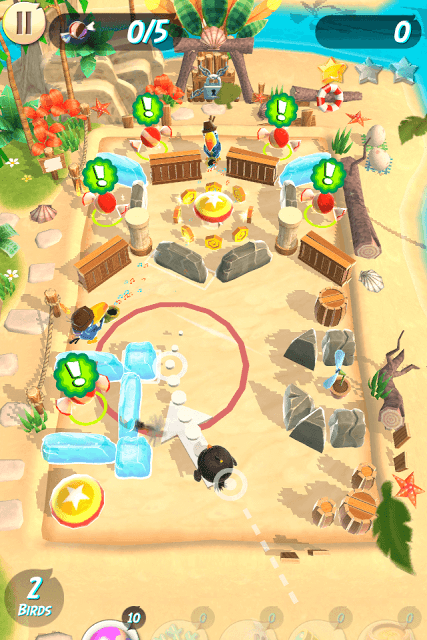 Angry Birds Action is a Pinball-inspired physics-based puzzler featuring your favorite birds. The game lets you toss a birdie into obstacles, collect valuable items and rescue eggs and candies in distress. And if you thought there are no pigs in this game, you are wrong. They do make an appearance, but arrive in an airplane dropping ice blocks, rocks, bomb crates and everything that might stop our birdies from reaching their goals. The game is easy to play, but levels become increasingly difficult as you progress. These tips, hints and tricks will help you know how to make the most of each bird, avoid a windy situation and complete stages faster. Go with the direction of the wind. You can easily see the wind’s direction in a level. If you go against it, your bird will move slower and won’t reach his target. If you don’t go against the wind, it will help your bird move faster. A saxophone-playing bird does not keep playing with the wind instrument all the time. He waits for a second or two and takes a breather before playing a not-so-melodious tune. When he stops playing, tap the bird and pull to launch in the desired area. When you press and pull, time freezes and everything comes to a halt. And because time stops at the right time (i.e. when the Toucan is not playing), your bird can easily get past the wind once you release. You can use your big birds to target saxophone-playing toucans to get rid of them. If there are such birds placed close to each other or in a line use the Bomb bird or Terence to target them and knock them out of the game board. However, fans can’t be destroyed AFAIK, so just make sure you go with the direction of the wind. You can use Chuck in wind-based stages as obstacles won’t have any effect on his speed. You can also take advantage of Beachballs in such stages. When you tap a beachball, your bird gets inside it. Launch it to an obstacle or anywhere you want. With every bounce your bird’s speed increases, thanks to the beachball’s special “boing” effect, and fans and saxophone playing toucans will have least effect on them. You get 5 free beachballs at the start of play. They are quite common and you might get plenty of them as rewards at the end of the level. If a level has fans, saxophone-playing birds and moving candies, then Chuck will be the best bird to deal with them. The yellow bird can travel in breakneck speed, and so can’t be affected by wind-based obstacles and moving objects. If you have Terence, then you probably don’t have to worry about anything. He is big and does massive damage to objects on impact. He can rip through rocks and wooden objects. But fans may slow him down a bit. He is big and heavy. Bomb explodes on impact. It’s a slow moving birdie, so it might be difficult for you to use him in windy situations. 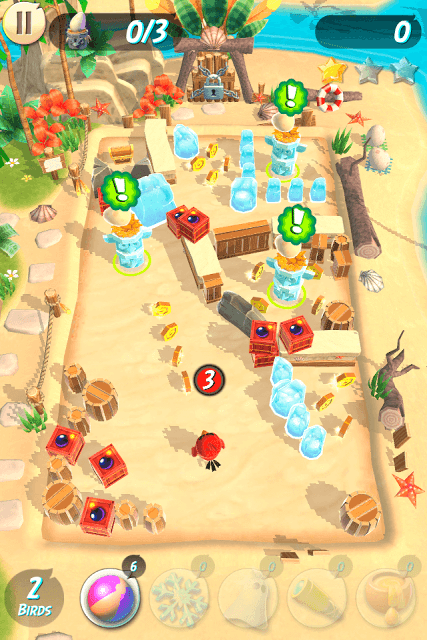 Use Bomb against tough obstacles like rocks and ice. Note: The above birdie guide is for those who have unlocked all birds in this game. Moving candies can be tough to collect. However, there’s a trick to get them. When you are about to launch a bird, time freezes. You can take advantage of this. Just tap and drag when a moving object comes in your bird’s field of view. You can also freeze time when the moving object moves to a place where there are a few obstacles blocking your bird’s view. Also drag to launch your bird when the moving object is closer to him. Each level has 2-3 stages. You will have to complete objectives in each stage to progress to the next stage. You finish a level when you complete all stages in it. In every stage, a birdie has 3 chances. If it runs out of chances before completing objectives, another bird will replace him. You will have to complete a stage’s objective before using up all birds. The number at the bottom-left corner of the screen shows how many birds are still left. If the count reaches zero and you have failed to complete objectives in a stage, then it is game over and you will have start from the beginning. If you have completed a stage with a bird or two left, you will reach a new stage and the bird count will reset. Try to make the most of every bird’s special abilities (read Tip No. 2) and collect at least half of the required objects or destroy obstacles with your current bird before using another one. The star meter at the top-right corner of the screen fills a little bit with every obstacle destroyed, but fills faster when your bird collects an object. The best way to earn stars faster is to destroy as many obstacles as you want in each turn and collect an object or two. The three stars that you earn will later be used to unlock three chests. You will have to select three chests from a group of chests. They might contain rewards like diamonds, and power-ups like beachballs. You should plan your attack before launching a bird. Choose a bird that can easily break obstacles. Select the Bomb bird or Terence and use them to break objects so that the next bird has easy access to the required objects. This nifty little trick can help you get access to hard-to-reach areas in Angry Birds Action as well. Use this trick if you there are too many obstacles in the middle of the board. Just press, pull and move your finger to the direction of the wall before releasing. You can equip your bird with a beachball to make it bounce and move faster or use this trick on chuck.